Hi everyone, happy Wednesday! It seems the week went by so fast; especially, since Monday was a public holiday to honor veterans who have given so much. Their services will never be forgotten. You probably have noticed an influx of pink from the runways to street styles. This fall, there is a call to “Think Pink!”—a great way to infuse color into the cold and dark winter. If you are not into bright or neon pink colors, you can try pastel pink as I previously wore here. I have never been “pink obsessed”, but I love a combination of pink with any edgy item or print. With this outfit, I chose my favorite Asos neon skirt and combined it with a chambray shirt to tone down the bright look while giving the overall look an edgy one. Thank you for stopping by…have a fabulous day! Love the Skirt and the pink and blue colour combo. 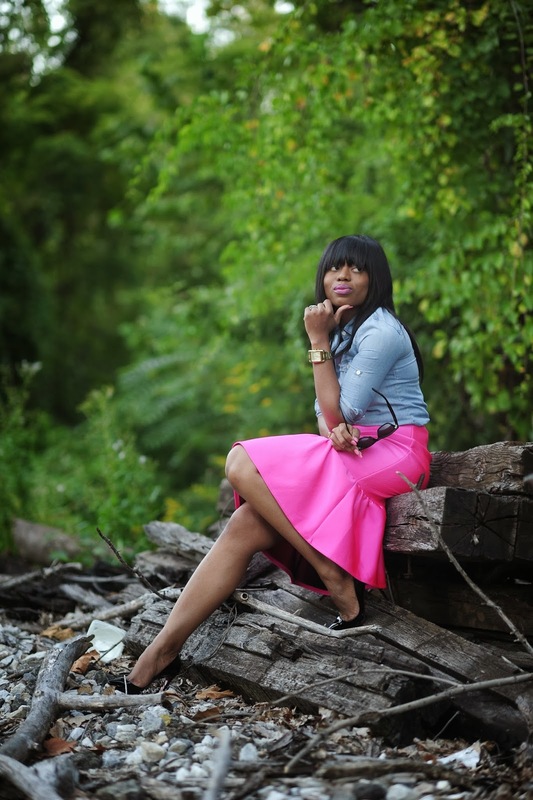 This pink skirt is so beautiful and show stopping! A chambray blouse was a great choice to pair it with! This our skirt....looking good mama!! That skirt is simply amazing. I saw it on another blogger recently. I wish they would re-stock it! so in love with your skirt. great outfit! Great combo. Love the skirt esp the frills at the bottom. Great combo. Love the skirt esp the frills at the bottom. I love chambray shirts as well, I'd wear mine to work under my suit if I could get away with it. Okay that skirt is everything!!! dint think someone can pull off a pink skirt you wear it with grace looks fabulous. Been planning to do a look like this for ages and i keep forgetting...lol. 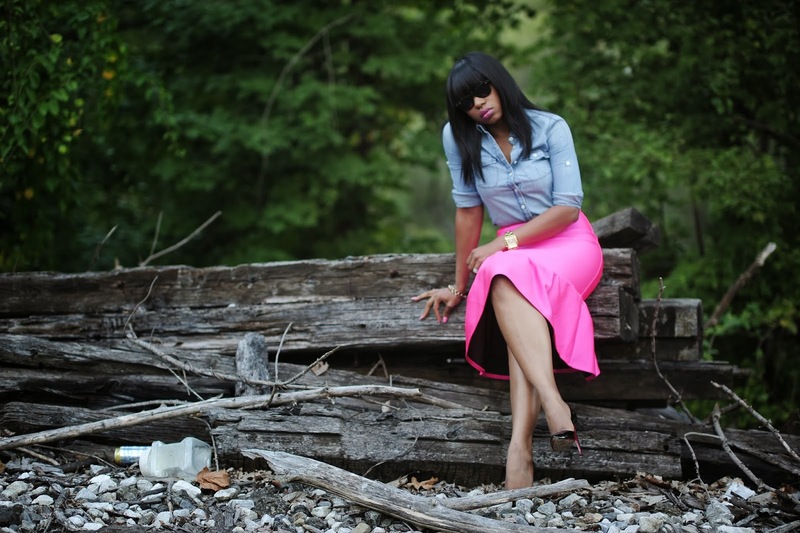 Love the edginess the denim gives the girly pink skirt. You look lovely as always. Im In Love for this Look!! Stella you are KILLING IT! Per usual. Asos owes you a freaking sponorship -- you have me adding everything to my cart! we hope we can do future collabs with you. Love that pop of girly pink. This color looks stunning on you. Perfect for the holiday!